But try to explain to progressives that privatized Social Security accounts, school choice, and other free market are empirically far better for the average citizen than statist solutions, and they’ll look at you as if you’re at best mad and, more likely, downright evil. I’m in Vienna, Austria, for the annual European Resource Bank meeting. I had the pleasure last night of listening to Jose Pinera speak about economic reform in Chile, particularly the system of personal retirement accounts. He shared a chart that conclusively shows why good economic policy makes a difference. Wow. Look at how much faster the economy has grown since the communists were ousted in 1975 and replaced by a pro-market government. * And the poverty rate has plummeted from 50 percent to 11 percent! 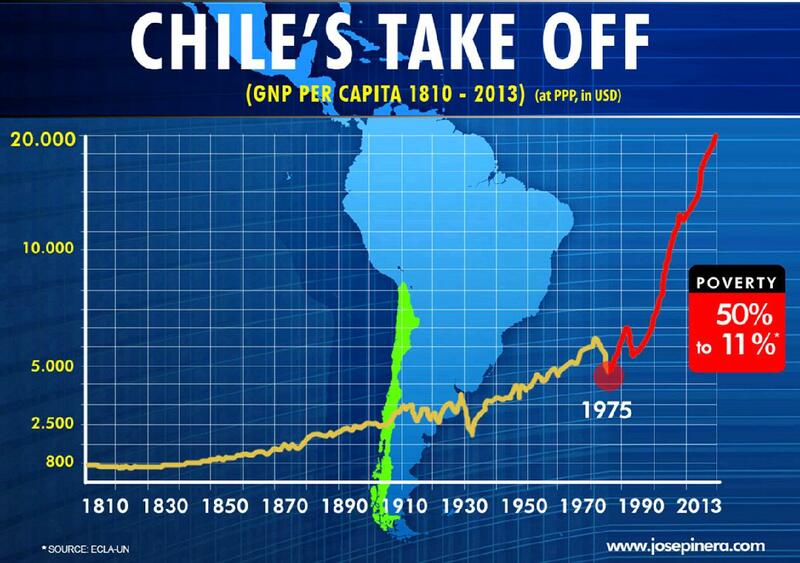 Simply stated, economic reform has been hugely beneficial to poor and middle-class people in Chile. Something to remember as we try to rein in the welfare state in America. I’ve long advocated privatizing Social Security, our nation’s public pensions system. The current set up, while supposedly a trust fund, is really just a piggy bank that lawmakers of both parties have raided time and again over the decades to pay for their grandiose programs while promising to pay it back later. The fact is, the system is broke. It’s just a giant Ponzi scheme in which current workers are paying retirees in the expectation that future workers will pay the current workers when they themselves retire. The hash that government has made of Social Security should be reason enough alone to take the money out of the politicians’ hands. But there are also positive reasons, too: rather than depending on the labor of others to pay for retirement at a rate determined by a distant bureaucrat, a worker builds up his own funds that he can use as he wishes, even leaving it to his children to augment their nest-eggs, and it treats citizens as responsible adults rather than infantilizing them. Unlike the United States and most European nations, Chile does not face a long-term Social Security crisis. This is because lawmakers shifted to a system of personal accounts almost 30 years ago. As a result, Chile’s economy is much stronger, the financial system is healthy, workers are better off, and taxpayers are protected. It also turns out that a system of personal accounts has a positive impact on the labor supply of older workers. Instead of getting lured into retirement by a punitive tax-and-transfer government system, they remain active to reap the rewards of a system that rewards them (rather than tax collectors) for continued work. Seeing the problems of our own system, the even worse ones facing European public pension systems, and then contrasting them with the private Chilean system should make the choice to transition to a private Social Security system easy. But, when Bush tried even a moderate reform in 2005, the statist Democrats and their big donor groups fought it tooth and nail, and won. Our system is only going to get worse as our population ages, requiring a huge tax burden on current and future workers to pay the benefits of those in the system or soon to enter it. A transition to a private pension system will be hard, but it will be even harder in the future. Unfortunately, with the (Social) Democrats in charge, we’ll have to wait until at least 2013 before any meaningful reforms can be made. Today’s Washington Post carries an article reviewing the career and legacy of Augusto Pinochet Ugarte, the general who lead the overthrow of the elected Chilean government with US support in 1973. General Pinochet died yesterday from a massive heart attack. I won’t comment on the pluses and minuses of the coup itself, other than to say most accounts attribute too much influence to the United States (which, no doubt, did play a supportive role) and not enough Chile’s own history and politics. It’s the typical anti-American narcissism of the Left that sees the US as the center of all the world’s ills, while ignoring local conditions. Okay, so I did comment a bit. Pinochet assumed power on Sept. 11, 1973, in a bloody coup supported by the United States that toppled the elected government of Salvador Allende, a Marxist who had pledged to lead his country "down the democratic road to socialism." Pinochet’s regime also engaged in foreign assassinations, most notably that of his predecessor, General Carlos Prats, in Argentina, and Orlando Letelier, a former Chilean foreign minister, in Washington. To this day Chileans suffer from the after-effects of what happened to them in the 70s an 80s: the current president suffered torture under Pinochet and lost her father to the General’s tender mercies. Defenders of Pinochet say he saved Chile from a Marxist takeover. They also argue that his free-market economic reforms created the strongest economy in Latin America. (Indeed, I’d love to see the US adopt the Chilean social security system.) All that may be true, but so much blood and corruption stains his hands that any accomplishments are forever tainted. He was a military reactionary hostile to liberal democracy itself — not democracy’s savior. Augusto Pinochet never faced justice in this life, so let’s hope he gets a full helping of it in the next.